The medical staff industry’s most trusted compliance manual is back and better than ever. Celebrated by medical staff and credentialing professionals for over 15 years, Verify and Comply is back, bigger, and better. 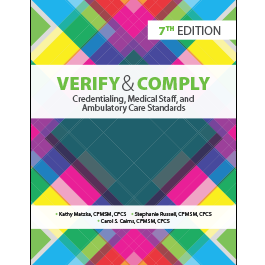 Verify and Comply, Seventh Edition, is the latest version of one of HCPro’s most popular credentialing and accreditation resources. Credentialing and medical staff standards and regulations are covered in one easy-to-navigate side-by-side crosswalk, giving MSPs one book that answers all their accreditation questions. This expanded guide includes ambulatory care, acute care, and managed care standards for the most popular regulators and accreditors: CMS, The Joint Commission, NCQA, DNV, HFAP, and AAAHC. This book allows you to compare what each accreditor states about initial appointment, reappointment, and other medical staff functions, and provides tips and best practices to help you meet the most challenging standards. Use this resource to study for the NAMSS certification exam and to keep up to date with regulators’ and accreditors’ credentialing and medical staff standards. With each new edition of Verify and Comply, our authors take the latest edition of CMS regulations and accreditors’ standards and do a side-by-side comparison to look for changes. The seventh edition is expanded to include CMS ambulatory standards. Kathy Matzka, CPMSM, CPCS, is a consultant and speaker with 25 years of experience in credentialing, privileging, and medical staff services. Matzka worked for 13 years as a hospital medical staff coordinator before venturing out on her own as an independent consultant, writer, and speaker. She has performed extensive work with NAMSS’ library team, developing and editing educational materials related to the field, including CPCS and CPMSM certification exam preparatory courses; CPMSM and CPCS professional development workshops; and NAMSS core curriculum. She also serves as an instructor for NAMSS. Matzka is a highly regarded industry speaker, and in this role has developed and presented numerous programs for professional associations, hospitals, and hospital associations on a wide range of topics, including provider credentialing and privileging, medical staff meeting management, peer review, negligent credentialing, provider competency, and accreditation standards. Stephanie Russell, CPMSM, CPCS, is the manager of medical staff services and education & credentialing at SwedishAmerican, a division of UW Health based in Rockford, Illinois. She has been an executive medical staff services professional for over 30 years, with the past 24 years at SwedishAmerican, overseeing medical staff affairs, including medical education, bylaws, regulatory compliance and accreditation, health system credentialing for both hospital and health plans, credentialing service contracts for outside entities as well as delegation agreements and audits. She is a NAMSS instructor and has made many presentations at state and national education conferences on topics related to credentialing, privileging, professional development, and regulatory compliance for both NCQA and The Joint Commission. She has also been a collaborator and coach with Team Med Global for the past 10 years. As a past member of the NAMSS board of directors and IAMSS board of directors, Russell has displayed her leadership skills and innovative perspectives and is known for “asking the tough questions.” She was instrumental in creating the newest NAMSS course on leadership. Carol S. Cairns, CPMSM, CPCS, has been in the unique position of seeing and participating in the development of the medical staff services profession for more than 40 years. In 1996, she founded Plainfield, Illinois–based PRO-CON, a consulting firm specializing in credentialing, privileging, medical staff organization operations, and survey preparation. In 1991, Cairns became clinical faculty for The Joint Commission by collaborating in the development of an educational program on credentialing and privileging medical staff and allied health professionals. From 1996 to 2006, Cairns served the National Committee on Quality Assurance as a surveyor in the certification program for CVOs. Cairns was invited by the American Osteopathic Association to provide input into the development of the medical staff and allied health professional standards for the 2005 Healthcare Facilities Accreditation Program Manual. Cairns is also an advisory consultant for The Greeley Company, Inc. in Danvers, Massachusetts.